One minute, Susan Murphy (Reese Witherspoon) is a regular girl about to marry the man of her dreams. Or so she thought. A few minutes before her wedding, Susan is hit by a meteorite filled with a powerful substance that makes her grow 50 feet tall. No longer considered normal, the military captures Susan and holds her in a private compound where she is renamed Ginormica. Here, she befriends four other ‘monsters’ who have been held in captivity for nearly fifty years. The monster entourage includes Dr. Cockroach (Hugh Laurie), the insect-headed brilliant mad scientist; the ultra masculine half-ape, half-fish named The Missing Link (Will Arnett); the gelatinous and brainless B.O.B. (Seth Rogen); and the 350-foot Insectosaurus. Together, they save mankind from a mysterious alien robot who tries to take over the planet. 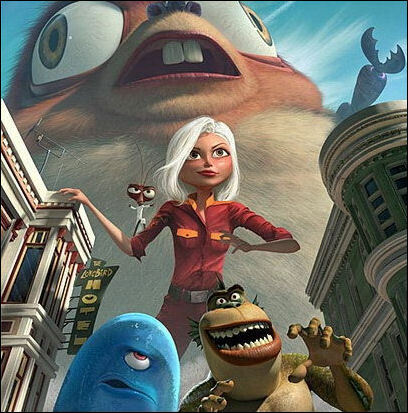 Monsters vs. Aliens is an animated action comedy by DreamWorks SKG. It opens nationwide on Friday, March 26, 2009. See it at IMAX theaters with 3D glasses.